Remember Evnt, the quick and simple UI to generate AS3 Event subclasses? Well, it's still here but I don't use it much anymore, since I'm a big fan of Robert Penner's Signals! So I wrote Signl. It's basically the same thing, but for Signals. 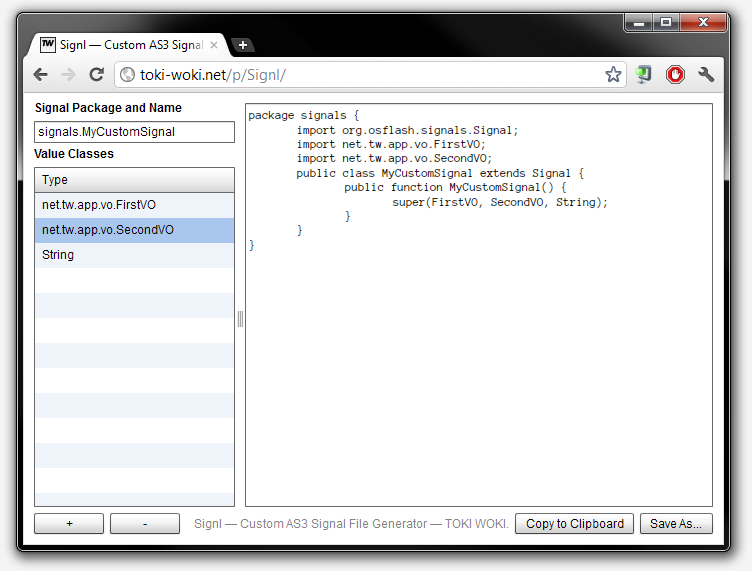 I know writing Signal classes is an easy task; but, why not make it easier? I hope this helps! Oh, and by the way, it's OpenSource, just like Evnt was. Posted on June 30, 2011 under Dev. This post is tagged as, flex, opensource, signals	and has one comment. Just like neil suggested, I added support for Deluxe, Priority and Single signals. The native. * package support will come later on.